At Cinegear Bright Tangerine was announcing some upcoming products as well as a current mattebox configuration guide called "Mattebox Underground." It's an easy way to see what parts are available/compatible with each system and what add ons work for what. 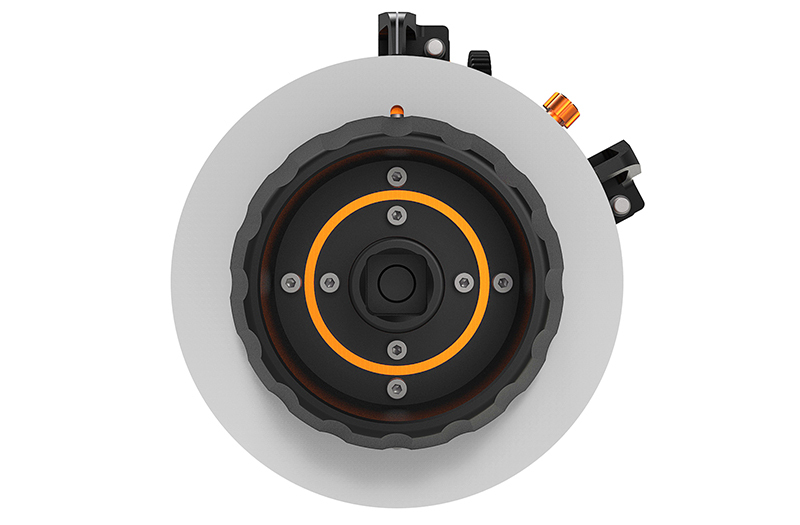 The Studio version of BRIGHT TANGERINE'S Follow Focus has been dubbed "Revolvr ™ ." (Revolvr ™) It can be added. Let me know your interest! 6. Gaffers Glass - Yes, the old school gaffers glass gets an update. Basically a hand held unit with a heavy variable ND vs. the standard fixed density gaffers glass that's been around for ages. BT says you will be able to look directly at the sun with it. If you haven't already, check these guys out at Brighttangerine.com. Feel free to ask questions and I'm sure some of the other BT owners here on Reduser can attest to the company and their products. Really glad to be one of their first customers and happy to see them continually innovating. Bright Tangerine has announced the release of the new Bright Tangerine Misfit Atom, the smallest, lightest mattebox ever made! Even better are the features and incredibly low price. Covers lenses up to 14mm at 5K full frame!! No more taping filters to the lens when you need to cut the weight of a mattebox. The new core system detaches from the shade and can clamp on to your lens. Genius! It even has the ability to tilt the filters to remove glare/reflections or shadows typically associated with stacking filters. It's one quarter the weight of the current Misfit which is already incredibly light.
" To create the lightest matte box possible, we stripped it down to the core. Almost weightless, Misfit ATOM gives you more possibilities than ever before. Designed with gimbals and Steadicam in mind, it’s exceptionally small, light, and affordable too." * Misfit ATOM weighs just 98g without the shade, and 195g with it. That’s less than a quarter the weight of a standard Misfit or LMB25. * When you’re pushed for weight, you won’t need to tape a filter to the lens anymore. With Misfit ATOM you can remove the shade and just use it as a filter holder. It’s safer, quicker, and a whole lot more. * The tray less filter holder allows you to load filters directly into the core, keeping weight to an absolute minimum. You can still tilt filters for total flare control. You can use one or two filters. Either 4x4 or 4x4.65, or even a combination of both. * To maximize strength to weight ratio, we cut from a single block of billet aluminium, and stripped it to the core. Just because we made it light, we didn’t compromise on strength. Made from hard anodized aluminum and elasto-polymer, you won’t find any plastic here. * If you want to be even lighter, you can detach the shade, and just use the filters. The shade detaches in seconds. The clamp is 114mm, and you can connect to virtually any lens with our range of Misfit adaptors. You can rod-mount to 15mm LWS, 15mm and 19mm studio rods, and it’s comparable with many Misfit accessories. * Why put up with unwanted filter reflections? You don’t have to, and with Misfit ATOM it couldn’t be easier to remove them. Simply place the filters in the diagonal position and the problem is gone. Prices start at $699 for the core! Kits start at $759. A fully loaded kit is priced at $1129! One very cool thing about BT is they LOVE user feedback. As a matter of fact that's how the Strummer DNA evolved, the swing away arm for Viv/Misfit, and the tilting module was born. It's another reason I stay loyal to BT. At Cinegear Andy asked me if there was anything I could think of that I could use either in the form of new feature or new products. He asked every customer the same thing. I really dig that. Yeah thanks a lot for the report. I'm also very close to buy a BT VIV5. No group buy coming ;-) ? Yoink count me in for a group buy. What is the tilting mechanism for? How is it used with a lens, or is it intended for Tilt-Shift lenses? It's mostly to offset the axis of your filters in relation to the lens to alter or minimize glare, reflections, etc..